The only income to the Club are the profits from the Club canteen and a portion of the registration fees. In order to upgrade some of the Club’s facilities/equipment, the Club relies on donations, sponsorship income and Council assistance or government grants. Sponsorship is a vital aspect of building a well-equipped and successful Club and therefore we are grateful for the many sponsors that make this possible. If you are interested in becoming a sponsor or know of someone that may be interested, please contact the Club President or Secretary and we’ll send you a Sponsorship Pack. The Club’s desire is to ensure a mutually beneficial relationship in which the Sponsor receives as much if not more in return for their generous investment. Thank you to our current partners IMB Bank and Rebel Sport. 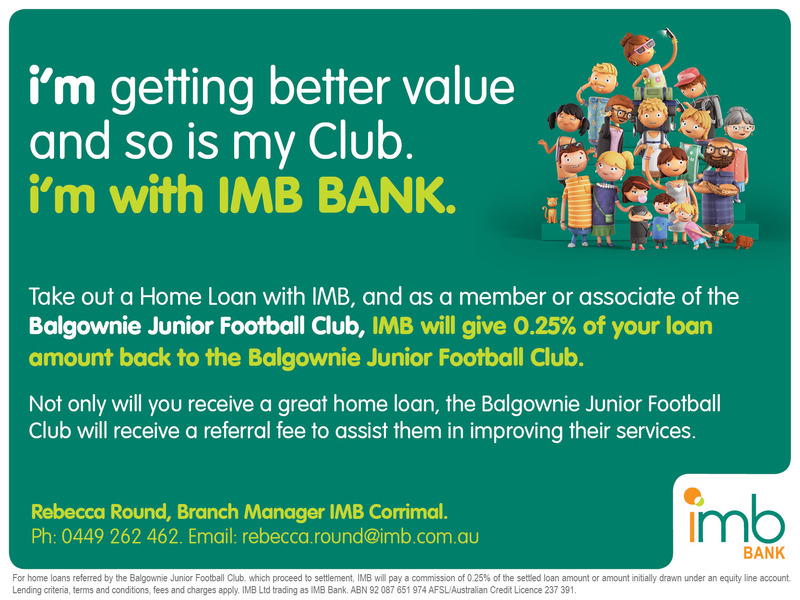 IMB Bank has put together a range of offers for Balgownie Club – click here to see the brochure. The Club has also entreed an Agreement wherby the club recieves commission on any loan that is taken out with IMB and you mention you are with Balgownie club. Make sure you and your family support them throughout the year!